OnLive Game Service is now available for users in the United States, and will suppose a revolution on how games are played. This service consists in a catalog of the latest titles in video games, that you can play on any device, because the game is not running in your PC, but in a server, that streams the video of this game through the DSL line to your Desktop PC, Mac, Netbook, iPad or any other device. Multiplayer across PC, Mac and TV platforms. Standard online games services such as gamer tags, user profiles, friends, chat, but with a twist: everything is live video. To play a particular game of the top-tier, newly released games, you will have to pay to rent it or buy it. I suppose this will have a much lower price than purchasing or renting the game in your town, as costs of distribution are eliminated, and also avoids costs and danger of piracy. 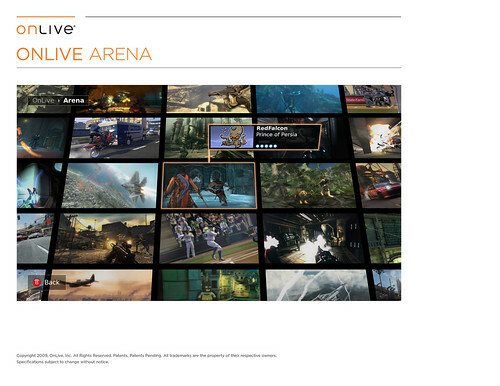 Initially, they’ll be offering the OnLive Game Service for PCs and Macs through a small browser plug-in. Later this year, they will announce the public availability of a MicroConsole TV adapter, to play games in a TV. Onlive Game Service is available for the USA since June 17. Other countries will have to wait, because the DSL connection in their countries is not fast enough. We may suppose that the service will expand first to those countries with faster DSL providers. In addition to Onlive, there are other businesses that have not been launched yet, that promise to develop similar services to allow every game developer to publish their own catalog. You will be able to play the most modern video games in any device, as long as it can be connected to a fast DSL. If the use of these services becomes a worldwide trend, piracy will be significantly reduced. Any computer will be valid to play any game, no more minimal requirements, at least you will only need a machine that plays video fast. You won't have to carry your games with you or be at home to play. Virtual worlds that are run in a cloud of computers and show stunning graphics and sound, played in every device, from a TV to a laptop, desktop, Linux, Mac, or iPad. 3D rendering services in a cloud of computers, to get your files rendered in seconds, delivered to your PC in minutes. Real-time 3D demos at top resolution without the risk of piracy. Augmented Reality applications of high complexity executed in the cloud and delivered to your device in a streamed video layer that combines with the input of your device. An exciting future has just started, don't you think?